I had heard the old Jackson High School was going to be torn down, so I wanted to see if they had started demolition yet. 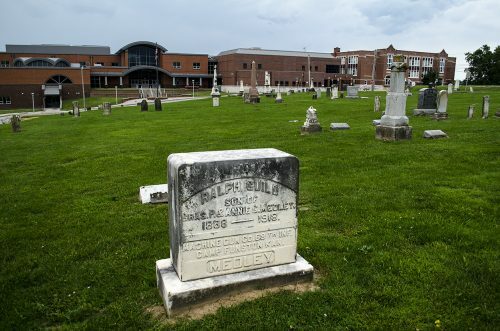 While there, I wandered around in City Cemetery, which is in front of the school. I was looking for graves of servicemen for a possible Memorial Day post. I found plenty there and in Russell Cemetery, but this happened to be the first I researched. It stopped me in my tracks. I’ll save the others for later. Click on the photos to make them larger. Yesterday afternoon, perhaps more forcibly than ever before, the fact that we are in war was brought to the mind of the citizens of Jackson when two caskets, each draped with old glory, were taken from the Iron Mountain train at the same time. As if a hush had fallen over the city, all was still, and the large crowd assembled stood about in respectful silence. 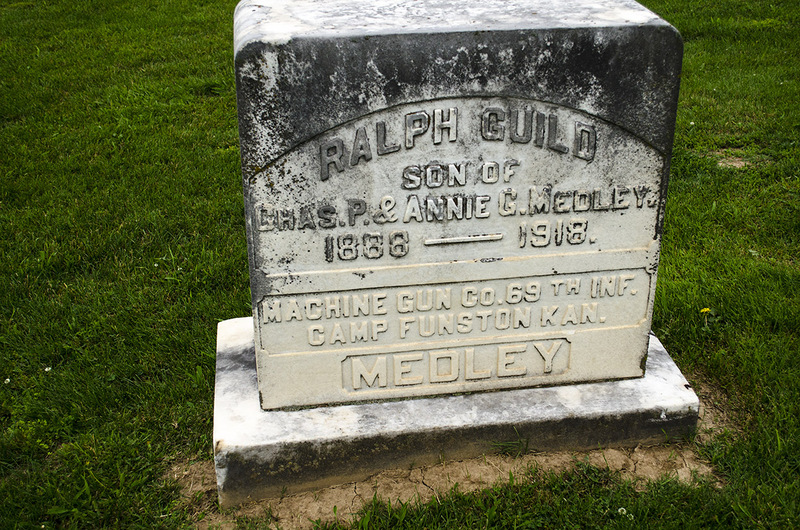 The body of Ralph (Ray) Medley was taken to the home of his parents, Mr. and Mrs. Charles P. Medley, south of the city, and was in charge of Maple Stevenson, the death soldier’s comrade in training camp. the other body, that of Arthur Winter, which was in charge of a sergeant from Fort Grady, Mich., was taken to the city cemetery, and was given a military funeral by the Jackson Home Guard, the first military funeral seen in Jackson by the present generation…. The funeral of Ralph Medley was held today at 9:30 at the city cemetery, and the attendance was a large one. A mound of flowers also marks the last resting place of this young man, who gave his life to his country. Ray was a splendid young man, quiet and unassuming, a true farmer boy who combined hard work with a good education, and by this combination had begun to make a success as a farmer, when the call to arms came, and he began to fit himself for the service, only to be laid low by the dread disease now sweeping over the land. I didn’t know to look for Arthur G. Otto Winter’s stone, but I did find two stories about him in The Missourian. October 12, 1918: Otto Winter, one of the young men in the army from this city, died at Fort Grady, near Sault Sainte Marie, Mich., yesterday afternoon, the influenza and pneumonia causing his death. He was sick only a few days. Otto was about (…) years old and was the son of Mr. and Mrs. Gottfried Winter, both of whom are dead. One sister, Mrs. Laura Winter, lives here and another, Mrs. Ben Pletl, at Cape Girardeau. Other relatives live in Perry county, from whence the family came to this city some twenty years ago. The young man was sent into training camp from the county during the summer months and was a private in Company A, 18th Battalion of Infantry, stationed in the fort above given. He was an employe of the milling company here from the time he was old enough to fill a position until his entrainment for camp. October 16, 1918: (from the story above about two Jackson boys coming home): …Rev. W.G. Langehennig of the Lutheran church officiated at the grave, and at the conclusion of the short ceremony, bugler Lail stepped up and sounded taps, while the men of the home guard stood at “parade rest” with bowed heads. The floral offerings were profuse and beautiful, showing that the citizens of Jackson know how to honor their soldier dead, even if they occupied a lowly station in life, like Arthur Winter, who was a day laborer before his entry into the army. Tthe flag in the courthouse yard was at half mast during the funeral.